Since its release in 2003, WordPress has steadily grown, becoming the most used content management platform in the world. Its availability on most hosting networks and extensibility through third-party plug-ins have made it the platform of choice for organizations around the world. With tens of thousands of plug-ins and such and a wide community of users, you would think that any platform would find it difficult to compete with the WordPress craze. But, in reality, there are important key points that make Anointed Press Web a vastly superior choice to WordPress. Let’s explore those points. When clients move from WordPress to Anointed Press Web, there is an almost immediate reaction to the speed and performance of our platform over WordPress. Our websites consistently load 3 to 10 times faster than WordPress websites, regardless of their complexity. In addition, our management dashboard is just as lightning fast. The apps that power your website are optimized for top speeds and performance, and all of the sites are hosted in our tier-one datacenter on servers that are more than adequate to run your website, regardless of how much traffic you generate. Unless you are a WordPress guru, the platform can be a beast to learn. Picking and installing a template is somewhat easy. Managing simple page content is also easy. But, beyond that, get ready to learn HTML and CSS with a side of PHP. Parts of your website can be managed through the WordPress interface, while other parts will require you to FTP into your hosting account and change files there. If that’s beyond your expertise, no problem – there are plenty of WordPress developers with affordable hourly rates. With Anointed Press Web, it’s all easy to do and learn. Even our most technical pieces such as modifying your template and adding third-party widgets to your website are centralized and easy to get to. Best of all, if you are having problems doing something, our support team is here to help. You can call or submit a support request for anything you want to learn – and even schedule training time with a live support representative. No matter how easy we try to make websites, there are always complicated pieces to them if you want to enjoy flexibility. WordPress provides you with direct access to every file that powers your website and allows you to modify them in any way. This “open source” nature of WordPress sounds like an advantage until you try to update a website someone else was maintaining. With WordPress, there is more than one way to do many things. Many times as webmasters learn more about WordPress, they alter the way they do things many times, causing your website to become a convoluted, overly complicated, Frankenstein of a thing. With Anointed Press Web, our main website files are “closed source”, which means your cannot modify the way our platform works. Just like companies such as Apple do, this allows us to maintain and curate the technical details and changes of your website. However, we give you access to all of those systems’ settings, allowing you to change the way your website works without affecting the systems behind the scenes. From modifying your templates and website customizations to installing system applications, Anointed Press Web provides the very best functionality for your website without allowing for unauthorized changes to the systems behind it. WordPress has an impressive assortment of plug-ins for just about anything you can think of. That’s the greatest appeal of an open platform – that you can extend it by creating your own plug-ins. There are tens of thousands of them for WordPress, created by everyone from hobbyists to experience developers. They range from elegant solutions to terrible, buggy plug-ins that are full of security holes, opening your website up to hackers and cyber-attacks. Sadly, the latter is most of what you will find with WordPress. With Anointed Press Web, we already have a number of built-in applications that allow your website to do everything from run a blog to take online payments. You can run your newsletter through us as well as a full-featured online store. It’s all closed source and developed by us. If you ever need something we don’t have, you will be working with the actual developers of the platform, not a high school kid working for gas money. This is your worldwide web presence, for Pete’s sake. Shouldn’t we be taking it seriously? Because WordPress is available for free to hosting companies, just about every one of them allow for the platform to be installed within your hosting account. But, once WordPress is installed, you are on your own. The only support the hosting company will give you is related to your hosting services (web hosting, email, FTP, etc. ), not your website itself. You can also hire someone to support you for an hourly fee or monthly retainer, but that cost must be added to your hosting costs. With Anointed Press Web, you have multiple levels of support included in your service with us. You can call us, message us, and even schedule hour-long training sessions (available for a per-session cost). We’ll walk you through any aspect of using our platform, no matter how small or complex it is. WordPress is hailed as a search engine friendly platform. Much of the search engine optimization you see within the platform is through the use of “long-tail” URLs, addresses for your pages that use keywords within the address itself. But, SEO is so much more than that. If you want to manipulate meta tags, additional plug-ins are necessary. Anointed Press Web has baked everything you need for a well-optimized website right into our platform with no plug-ins necessary. We empower you to define default meta tags and content for your entire website as well as defining per-page tags. Google & Bing compatible sitemaps are generated on the fly. Page URLs use addresses that match your page names automatically. Our apps use search engine friendly URLs as much as possible. In short, our platform automatically does what WordPress users do manually and with the help of plug-ins. The WordPress community has developed an impressive volume of website templates to choose from. Although caution must be taken to choose a template that is compatible with the version of WordPress you intend to use, there is always a wealth of designs to choose from. These designs are created by both amateur and professional designers and developers from around the world, and are sold to organizations and businesses like yours many times. In order to have a unique look, you have to be prepared to modify the website template you purchase, sometimes substantially… and boy can that be complicated! With Anointed Press Web, there are no pre-built templates to choose from. We create everything from scratch for each of our clients. While custom designed WordPress templates can cost hundreds or even thousands of dollars, we extend a very generous discount allow even the smallest organization to take advantage of our professional design capabilities for as little as $99. It’s literally the best deal in the world. The biggest challenge for most organizations has little to do with the technology. WordPress, plug-ins, hosting – who can keep up with this stuff? The biggest logistical challenge is always finding the right person to manage the website. There is no shortage of people who dabble in WordPress. While there are definitely a handful of true experts, most organizations are at the mercy of someone who is learning on their website. Is your web presence worth so little that you can afford for it to be someone’s science experiment? Anointed Press Web’s team has served many churches, ministries, charities, and small business from all over years. Our entire team as at your disposal – not just one person in your organization who “knows computers”. Best of all, we can be an extension of whoever you assign internally to maintain and grow your web presence. Just pick the right level of service for your needs and enjoy working with one of the most elite teams in the world, led by one of the most experience veterans in the Christian website technology industry. There’s no bones about it – WordPress is a great platform for bloggers and do-it-yourself webmasters. But, for most businesses and non-profits, they just don’t have the time and luxury to wait on someone to overcome all of the obstacles and become truly proficient at the platform. Anointed Press Web provides everything you would have with WordPress plus all of the advantages OVER WordPress, along with a team that is here to serve you, no matter what your needs are. Even if you find inexpensive WordPress hosting, the price you will pay for developers, plug-ins that don’t work, and lost time/effort costs many times more than what you would spend to just solve the problem through Anointed Press Web. So, why wait? Let us know how we can serve you by filling out the form to the right and getting started today. 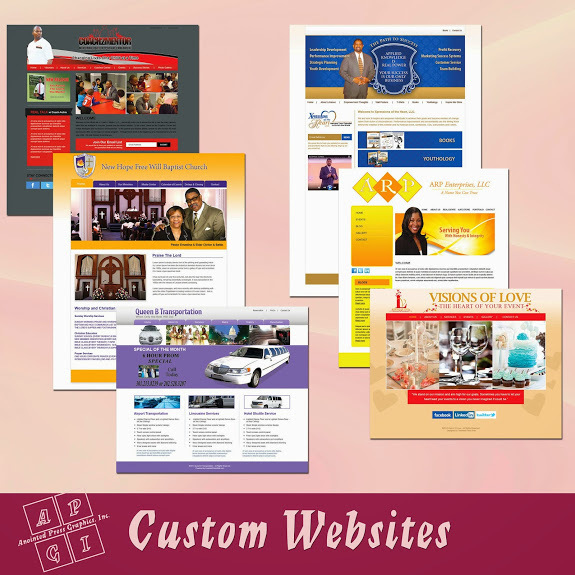 We look forward to assisting you in creating a website to match your BRAND. 301-782-2285 Call us and lets discuss how we can UPGRADE your BRAND.